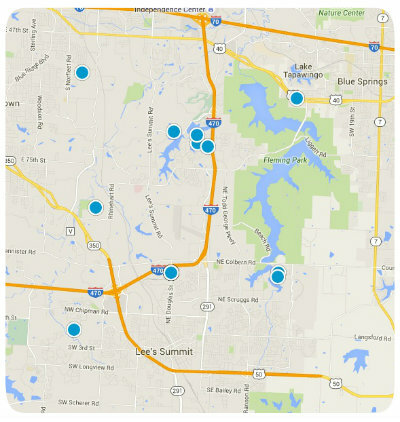 Within Lee’s Summit there are a number of exceptional neighborhoods and subdivisions with diverse real estate options. White Ridge Farm is one such community. White Ridge Farm is located north of Summit Crossings, west of SW Lakeview, south of Highway Lanes and Summit Woods, and southeast of Sterling Hills. Longview Lake is to the west of White Ridge Farm, and along with several other area lakes, affords residents an abundance of recreation opportunities. Homes for sale in White Ridge Farm are primarily single family homes and have a median listing price around $172,450, or $71 per square foot. Typically White Ridge Farm homes start around $165,000 and top out around $300,000. Homes are of traditional styles with a lot of ranch and raised-ranch properties. White Ridge Farm is home to approximately 927 residents who describe the community as friendly, quiet, convenient, safe and walkable. Students who live in White Ridge Farm attend Pleasant Lea Elementary, Pleasant Lea Middle, and Lee’s Summit High schools. If you would like more information regarding homes for sale in White Ridge Farm of Lee’s Summit, Missouri, please contact us today. Listing courtesy of Lanny Dillenschneider of ReeceNichols Lees Summit.